← Should I Restore My Vintage Bicycle? Bicycles have not always had the same type of chain. In the early days, bicycles didn’t have chains at all… the pedal cranks were connected directly to the front hub of the bicycle, like a child’s tricycle. Eventually, technological advancement made the use of chain possible, allowing for many new innovations that would evolve into the bicycle as we know it today. 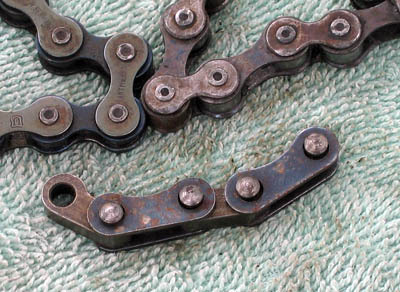 Early bicycle chain was primitive and did not perform nearly as smoothly as modern chain does. One type of early bicycle chain, often referred to as block-chain was a simple design that consisted of a block, linked by two thin pieces of metal on the sides and pins to hold them together. There was a lot of friction involved with this design. This problem was solved by roller-chain, which is what modern bicycles still use today. The roller chain has an additional component… a piece of tubing around the pin that acts as a bearing, greatly reducing friction as it rolls over the sprockets. Upper left – 1/2 inch pitch chain. Upper right – 1 inch pitch, aka “skip tooth” or “skip link” chain. Lower middle – early “block” chain. Left – 1/2 inch pitch sprocket. 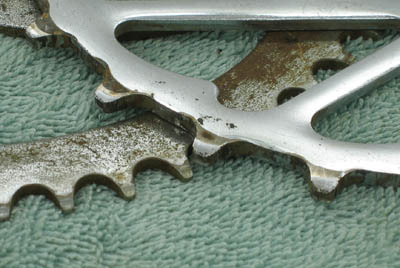 Right – 1 inch pitch, or “skip-tooth” sprocket. In the next article we will cover how to shorten or lengthen a chain and how to refurbish a rusty one, plus correct adjustment and lubrication. Have a question? Feel free to email dave@nostalgic.net. Diamond brand chain, new in the box. Often, someone not familiar with vintage bicycles will acquire an old bike and learn that they are unable to find a replacement chain that will fit the bikes sprockets. In all likelihood, their bike was equipped with a 1-inch pitch chain… a type of chain that has not been available at bike shops in many decades. 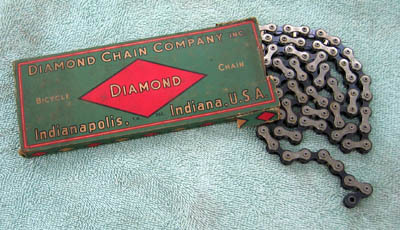 1-inch pitch chain, commonly referred to as “skip-tooth”, or “skip-link” chain, was used on most bicycles from the 1900’s through the mid 1950’s. This chain fits sprockets where the teeth are one inch apart. This chain is also wider than modern half-inch pitch chain. This configurations means that the chain fits a sprocket that has half as many teeth as modern one where the teeth on only 1/2 inch apart. So the question is… where do you get new skip-tooth chain? Unfortunately, you can’t. 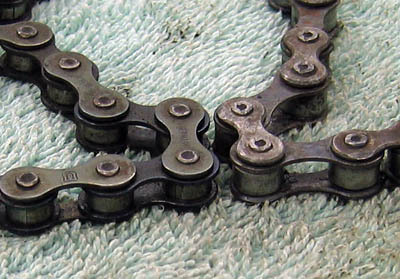 If you insist on un-used chain, your only option is to buy some from a vintage bicycle dealer, at a swap meet or on eBay. You can expect to pay up to $100 dollars for a brand name chain that is new in the box. Fortunately, if your bike was equipped with 1/2 inch pitch chain, the same type used on modern bicycles equipped with single speed hubs, you can buy new chain from your local bicycle shop. If you buy inexpensive BMX chain from a department store, be aware that this chain is usually not long enough to fit vintage full size bikes. There are ways to make the chain longer, but the better plan is to buy a correct chain from a bicycle shop. Left – 1/2 inch pitch chain with equal length links. Right – 1 inch pitch “skip-tooth” chain with un-equal length links that are also wider.